The final proposition – traditionally meant to be funny – is a witticism stolen from my father. It was also the final proposition to his doctoral dissertation, which had nothing to do with political leaders (it was about coins in the 17th and 18th century Dutch economy). Is it true though? I think there are statesmen (and stateswomen, although the word is tellingly awkward) who are recognized as such before their death, including Roosevelt. It is, however, important to realize that historical statesmen in their own present were – certainly in democratic systems, but probably elsewhere too – in the first place politicians whose power and elevation above common partisan (and intra-party) politics were by no means a given. 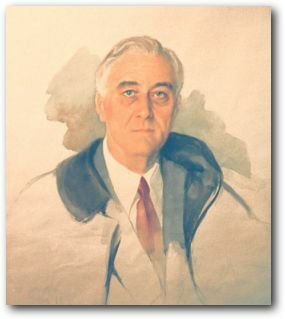 Michael Kammen has argued that Americans tend to depoliticize their history, and this has contributed to the remembrance of FDR as a statesman. Had Roosevelt not already been regarded as a statesman during his life, one might even argue that his becoming a dead politician in office contributed to his elevation to statesmanship. A statesman is a dead politician.